It's been a relatively uneventful few days in our household, which has contributed to my lack of blog writing. I feel like we're in a "holding pattern" of sorts right now, just waiting out these last 4 weeks until Chase is born. Don't get me wrong -- there are a lot of things we'll need to do before we head to Charleston, but most of it just can't be done until a few days before we hit the road. I've been trying to enjoy this time as I know this life as we know it will never be the same again! I've been trying to focus on LO and have as much fun with her as possible, since she'll be vying for her parents' attention in a few short weeks. I've been trying to mentally prepare myself as best as I can as far as what to expect and how to handle the roller coaster we're getting ready to board. Overall I have to admit that I think I'm in the best place possible mentally. God has truly been working on me and reminding me of His presence through all of this, that He's in control of our circumstances and He has a perfect plan for our family and especially for our darling Chase. 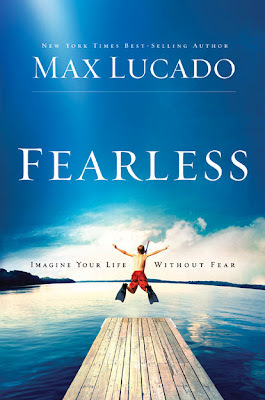 One great source of inspiration I came across last week was a wonderful book by the famed Christian author, Max Lucado. The book is titled Fearless. I got it a few days ago and started reading it yesterday. I haven't been able to put it down! The book covers several different kinds of fears and many of them have spoken to my heart. Specifically, chapter 5: My Child is in Danger: Fear of Not Protecting My Kids. I cried my eyes out as I read the words of inspiration Max put on the pages -- words of inspiration straight from the heart and mouth of my Lord and Savior. I highly recommend this book to every person on the planet, but especially to parents and even more specifically to parents of children struggling with health problems. Let God use this book to remind you that He is with you through every fear. I've placed my trust in Him. I've placed my son's life in His hands (my children belong to Him anyway!). I'm keeping my eyes on Him so I will not falter as I face the most difficult situation of my life. I am so grateful for His love for me and my family, and for His innumerable blessings. What a concept to embrace life with a spirit of FAITH, not FEAR!